This was the big weekend, the one where home changed locations. I keep trying to remember the day we moved out of our first apartment in this city, into a slightly larger, slightly quieter one four doors up the block. I can picture the movers -- one in particular, who carried a very tall bookshelf on his back around three flights of curved stairs like it was a pocketbook. I remember our first night in the new place, marveling at how much of a difference four doors west could make for the noise level. Everything was so...quiet. 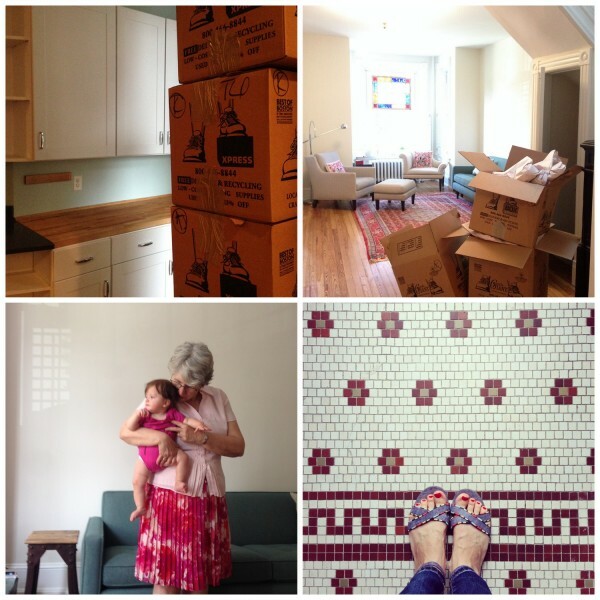 But before I picture all of this, my mind skips two steps backward, to the day I moved us into that first apartment, on the corner of a quiet street and a busy one. The apartment with the big bay window, the Formica counters, the incredibly-hip and not-totally-practical lofted bedroom, the wall I insisted on painting pink. Move-in day was just me - D was still in Michigan - and a pile of cheap furniture I'd found on Craigslist. One of the two front doors was stuck shut, so I spent the bulk of the day jamming the legs of various tables in the small front opening, then around and around that three-flight twisted staircase. That was eight years ago. Since then, we've accumulated five more bottles of bitters (current favorites: Fee Brothers black walnut; Jack Rudy aromatic), and a pantry full of last year's preserves threatening to take away my canner for the season if I don't use them up soon. And of course, now we've got our daughter, too. She comes with her own accumulation: books and toys and tall stacks of hand-me-downs that could last beyond her first birthday. There certainly was more to pack and move this time around, which caused several nights of sleeplessness, 24 hours of mild turmoil, and lingering fatigue. But even more daunting than the actual move is the prospect of trying to hold onto memories from three homes. I don't want to lose any of it. Our kitchen has been dark for much of the past month, save for a couple meals over father's day and a last-hoorah birthday dinner for our friend Jana. But before we shut down operations entirely, I cooked a batch of porridge from Ottolenghi's newest book, Plenty More, for breakfasts. In a week full of transitions, that porridge was the perfect thing. Comforting and familiar, like a good bowl of oatmeal. Fresh and intriguing, from fragrant marinated orange segments and a pile of sugary, crunchy sesame seeds. The new and the old, together. That is how we will proceed. I find constant inspiration from Ottolenghi's recipes - his celebration of vegetables, his bold embrace of meatless feasts. That said, his recipes are extraordinarily fussy, and -- at least for me -- not always in ways that improve the result. I've simplified his instructions liberally, so that something as homey as porridge can stay that way. If you want to make the original, get the cookbook. It's worth it. Prepare orange topping: Peel off a strip of orange rind and add to a small saucepan. Next, supreme the orange, transferring both the segments and the resulting juice drippings into a bowl as you work. Set aside. Add sugar and water to the pan with the strip of zest. Bring to a boil, stirring regularly, and cook until sugar has dissolved, about 3 minutes. Set aside to cool; then add orange blossom water and reserved orange segments and juice. Make porridge: Drain and rinse the barley. Tip it into a medium saucepan with the remaining 2 tablespoons muscovado sugar, milk, citrus zest, and a three-finger pinch of salt. Bring to a boil, then turn the heat to medium-low and simmer for an hour, stirring occasionally, until the barley is cooked but still has some bite: if it's becomes very thick, add a little water towards the end. Make sesame topping: Toast sesame seeds by shaking them around in a small, dry pan over medium heat until fragrant, about 3 minutes. Combine seeds and 1 teaspoon of muscovado sugar in a mortar, and crush lightly. Set aside. Serve: Stir vanilla into porridge, then leave to cool for five minutes. Divide between four bowls. Dribble a teaspoon of tahini over each portion, spoon the orange segments and syrup, and sprinkle with sesame topping.